Single page applications, aka SPAs, are all in rage in the world of web application development nowadays. Many businesses are interested in it and developers want to explore it to bring out better ideas. Meanwhile, Multiple Page Apps have been doing steadily well for years. If you compare them on the basis of their value and reach in the market- each have their pros and cons. So which is better – single-page-application (spa) vs. multi-page web applications (mpa)? Single page applications are an app that works inside a browser and do not need page reloading during usage. There are many examples of SPAs around the net that you use every day, such as Google, Gmail, Maps, Facebook, Twitter or GitHub etc. SPAs help keep the user in on web space where content is presented in a simple and easy manner. Speed and responsiveness –Single Page web applications are fast; with them, a server doesn’t have to reload most resources such as HTML + CSS + Scripts with every interaction- only needing initial loading. Afterwards only new data is downloaded from the server. Plus, SPAs only reload particular pieces of content- so they have a lighter server payload. Offline support and caching – SPAs can cache to any local storage with dispatch. The SPAs sends one request to the server and then stores all the data it receives. The app can use the data, this is why an SPA can operate even offline, contrasting an MPA, so you can keep using it even if your device loses connectivity. Ability to separate data and UI- SPAs are able to distinguish between the data and the user interface. This can hugely help to streamline testing during the single-page app development. Furthermore, such distinction allows you to handle all future integrations and possible changes in how data enters the SPA framework and goes to the other systems without massive implications for the interface. Easier to debug with Chrome- this is because you can see all the code at once (since it’s all located on a single page). Furthermore, these apps are developed on frameworks that have their own Chrome developer tools like AngularJS Batarang or React developer tools etc. Security concerns – compared to traditional applications, secure single page application are less to come by. Due to cross-site scripting(XSS), attackers exploit this and inject client-side scripts into web application by other users. Poor crawlability- SPAs have a smaller semantic kernel than an MPA. You can only put a limited number of keywords on one page. Therefore, for this reason, you should thoroughly consider what content best matches your users’ request. Multiple page application work in a traditional manner, meaning every change, like for instance display or submitting data back to the server requests renders a new page from the server in the browser. MPAs are larger and bigger comparatively because they need to be- because of the amount of content, MPAs have many levels of UI. Fortunately, that’s a non-issue now, due to AJAX there is no need to worry about big and complex applications having to transfer a lot of data between browser and server. AJAX allows “refreshing only parts of the page and not the whole page”. Meanwhile, it adds more complexity and it is more difficult to develop than an SPA. One of the primary benefits of MPA is that it is the best approach for a heavier application which can’t be well-presented and implemented on a single page format. MPAs are quite helpful from SEO perspective. It gives better chances to rank different keywords since the application can be optimized for one keyword per page. The development is quite complex. The developer needs to use frameworks for either server and client side. This, invariably leads to a longer time of application development. To figure out whether you need a single page or multi page website, you’ll need to consider the objective and goal of your application. If you need multiple categories, for e.g. – like an e-commerce website or a website with a lot of content, then you’ll be better off with a multi-page site. If you are convinced that your website is appropriate for a pure single-page experience, then go for it. If you’d like your website to be an SPA, but, can barely fit everything on a single page- then you can consider a hybrid solution instead. A hybrid application is the best of both worlds as it takes the best of both approaches and minimizes the cons of both. A hybrid application is, in fact, a single page application which uses URL anchors as synthetic pages allowing more to build browser navigation and preference functionality. 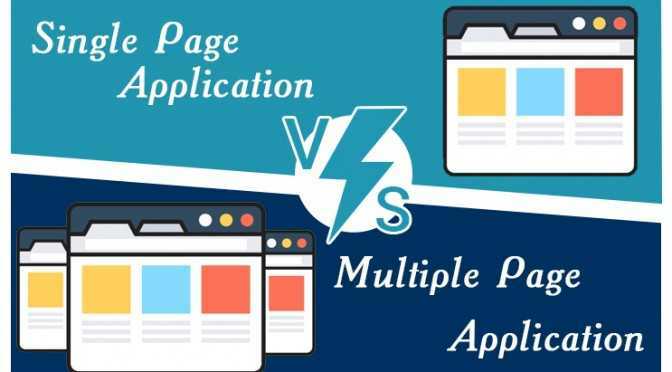 Regardless, the above points weighing in the perks and pitfalls of using single page vs multi-page applications will help you choose which one will serve the maximum benefit to your business.